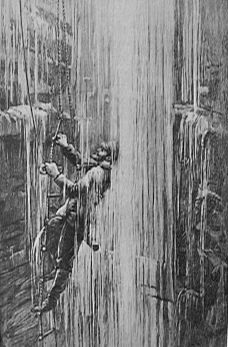 Image: E. A. Martel on one of his most famous expeditions into Gaping Gill, Yorkshire, Great Britain. Painting by Lucien Rudaux. From the Martel Galery by Bernd Kliebhan. Open: May bank holidays Mon-Fri 9-, Sat, Sun 8-. August bank holidays Mon-Fri 8-, Sat, Sun 9-. Fee: Per person GBP 15. Classification: Karst cave River cave Great Scar Limestone. Address: Bradford Pothole Club, Tel: +44-1274-615069. Craven Pothole Club, Tel: +44-1756-790223. 1895 first explored by E.A. Martel. Gaping Ghyll is a hole in the surface of the yorkshire landscape, long known to the locals. The Fell Beck drops 100m from the moor into Gaping Ghyll, Britain's largest cavern, and the fall of the Beck into the pothole is Britain's highest unbroken waterfall. The water flows underground to Ingleborough Cave, to reappear in a well near Clapham. Gaping Ghyll (or Gaping Gill) is not open to the public, as it is not a developed cave. Cavers need a permit to visit it. But every year on the May and August bank holidays, there are so-called winch meets. At those events, everybody can become lowered down for a guided tour. The visitor sits in a kind of swing mounted at a steel cable. It is British humour, that the descent is free and ascent costs 15 Pounds... The spring bank holiday winch meet is organized by the Bradford Pothole Club. The autumn bank holiday winch meet is organized by the Craven Pothole Club. The first part of the pothole is a narrow shaft, the visitor is hit by some water of the waterfall and the walls of the shaft. Then the Main Chamber opens up, a huge dome 129m long, 31m high, and 25m wide. This is said to be Britain's largest cavern, and probably its most spectacular, with a little daylight falling in from above and the huge waterfall. The amount of water is normally rather small, as the winch is closed on rainy days. Thats a security measure, as the ascent is dangerous or impossible with too much water. The water of the Fell Beck is dammed above the cave entrance, which normally works very well. The water just finds another way into the cave system. The floor of the chamber is like a riverbed, with pebbles and sand, but almost level. On the winch meet it is full of people walking around, looking, taking pictures. There are small guided tours offered by the cavers, stories told about floods, and about the five alternative entrances. To visit Gaping Ghyll it is necessary to walk from Clapham to the cave entrance. The trail is called Ingleborough Estate Nature Trail and the Ingleborough Show Cave can be seen along the way. The walk is four kilometers long and uphill, it takes about 1 to 1.5 hours to reach the cave. There is a note at the show cave if the winch is not operating because of bad weather, or you can ask at Home Barn outdoor shop in the village. The tour requires special clothes, but it is not necessary to purchase cavers gear. If you wear warm, waterproof clothing and boots you are well prepared for the weather on the moor and inside the cave. We would recommend, bring Wellingtons and a second set of warm, waterproof clothing for the cave. A big plastic bag for the wet and dirty clothes and a towel are useful after the visit. A good lamp is also a good idea, we recommend a headlamp, helmets are provided. If you want to take pictures bring a tripod, and enough flashes. Be aware that the dripping water inside the cave may damage your gear, waterproof cameras are a good idea. The winch takes about one minute either way. During busy periods it may be necessary to queue, both down and up, so warm clothes are essential. The winch carries up to 125kg, which includes clothes and equipment. Children are allowed only if accompanied by a responsible adult and the minimum age is 7. The winch meet in May 2008 was rather extraordinary. After the members of the Bradford PC had set up the winch and the tea tent during sunny weather, a large, dark cloud appeared. In only half an hour the weather changed, violent winds started and 22mm hailstones fell, and finally Fell Beck transformed from a trickle into a brown cataract. And while the weather again changed rapidly and the sun came out, the water of heavy rains was filling the riverbed. The ledge where the winch is mounted is more than 2m above the normal stream level, but the flood flowed knee deep on the ledge. The winch and its gantry were damaged by the flood, a surreal scene as the weather had cleared and the sun was shining again. When the first cavers went down into the Main Chamber of Ghaping Ghyll, they discovered that the water had flooded the whole chamber three meters high. The event was no problem, as it happened on the so-called prelim weekend, one week before the winch meet when the whinch is set up. It was possible to repair all the damage and the winch meet was a great success with more visitors than the year before. Such a weather condition is very rare, happens about once in thirty years, but global warming has increased its likelyhood substancially. However, Ingleborough Hill seems to have an ability to generate its own weather system, as the cavers put it. Nevertheless the cavers have several security measures for bad weather. To know who is in the system at all times, they operate a numbered tag system like in mines. A careful eye is kept on the weather, and if it becomes bad all visitors have to leave the cave immediately. If there is not enough time to get everyone up by winch, experienced cavers guide the more sportive visitors out through one of the alternative exits. Search Google for "Gaping Ghyll"